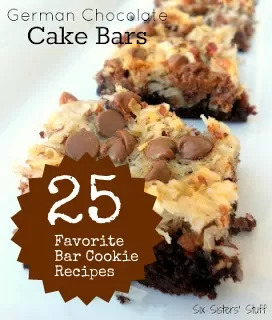 These bars have a delicious shortbread crust, a homemade caramel center, and a delicious chocolate top. They taste just like a Twix candy bar! 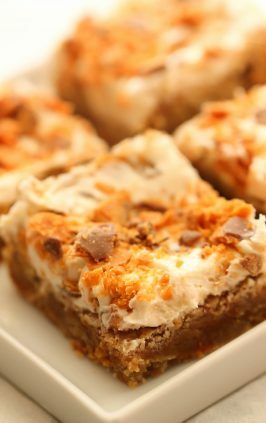 My husband doesn’t love caramel, but he ate these right up! That’s how you know they’re good! 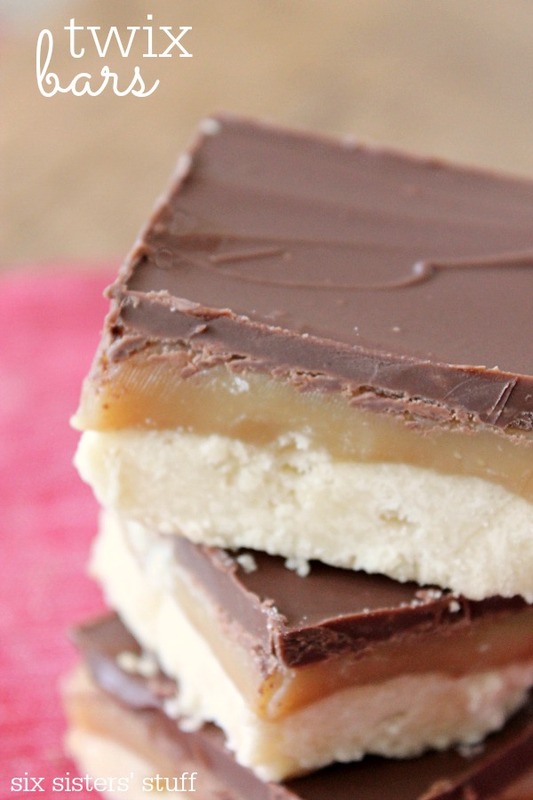 These bars have a delicious shortbread crust, a homemade caramel center, and a delicious chocolate top. They taste just like a twix candy bar! Preheat oven to 350 degrees. Grease a 9x9" pan with cooking spray. Press the mixture into the bottom of the 9x9" pan, and bake for 20 minutes - until the edges start to turn a golden brown. Pour the caramel mixture over the shortbread crust. Let it cool (I sped up this process by placing it in the fridge) until the caramel mixture starts to firm. In a microwave safe bowl, mix together the chocolate chips and vegetable oil. Microwave for 1 minute, and then remove and stir. Continue to microwave the chocolate mixture in 15 second intervals until it is completely smooth. Pour chocolate over top the caramel layer and let it cool. Once the chocolate has hardened, cut into squares with a warm knife (that will make them cut cleaner). These are British and called millionaire shortbread, soooo yummy! Did you use milk or semi-sweet chocolate chips? Hi Jennifer, we adapted the recipe from All Recipes. I went to the recipe on their site and read through the comments. A lot of people said they had made it a few times and it worked best to cool the shortbread before adding the caramel. We have not had a problem with the shortbread falling apart. You could add a little more butter so it's not so dry and see if that helps hold it together! Hi Jennifer, I tried making them and my dough turned out to be very dry and crumbly too. I added one egg and it turned out just fine! Maybe you over mixed it. I cut the butter in and then used a fork to cut in in better. Dump in pan and press in. Mine turned out fine. Or maybe you didn't use enough butter? Do you know if these can be frozen? 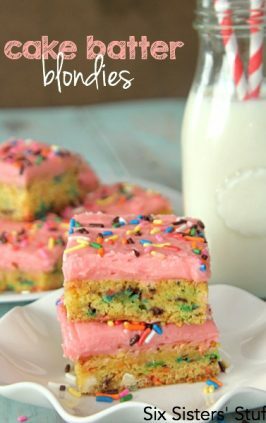 I am wanting to bake up some cookies early as gifts and am wondering if these would be a candidate. They look yummy! They should freeze just fine in an airtight container! They look so delicious! Say, is the shortbread crunchy like in the Twix bars? Not quite as crunchy because it's a homemade shortbread, so it's a little softer! Hope this helps! Are there any substitutes for the corn syrup? I found this about substitute for Corn Syrup on the Taste of Home website - For each cup of light corn syrup in a recipe, substitute 1 cup of sugar and 1/4 cup water. For each cup of dark corn syrup, substitute 1 cup of packed brown sugar and 1/4 cup water. This recipe calls for only 2 tablespoons of corn syrup so you would have to calculate the amount. Wouldn't be much at all. 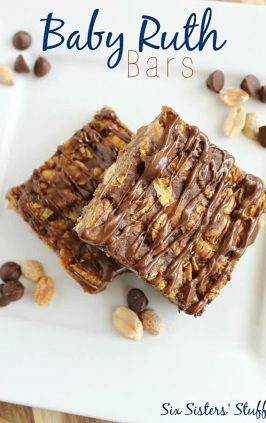 The best homemade candy bar recipe! I would totally recommend it to every one! Thank you Six Sister's Stuff! I was super excited to make these, but they did not turn out how I had hoped. I added a little extra butter because of some other comments regarding a crumbly crust. That turned out fine. The caramel was good, though people should believe the recipe when it says stir constantly. I did, but heat may have been too hot. The sauce caramelized a little and I got some charred pieces in the mix, but it still tasted fine and not burned. The thing that did not work at all for me (and I would love feedback on this part) was the chocolate. I followed that part precisely, and it turned out very hard and cracked all over the place when I cut it. It also had a white coating when dried. I used the oil, but I think it should have had a lot more than one teaspoon for the two cups of chocolate. In other recipes, I have used more shortening for such a toping with no problems. Sadly, they tasted just okay and not super flavorful. I think I prefer a sweeter shortbread, and maybe would add vanilla somewhere in the caramel sauce. Penelope, I know your post was years ago. I'm cooling the crust now; but I tasted the dough and thought it was kind of bland. And just now reading your comment. . . . . . .duh, that's it. . . . .NO vanilla. 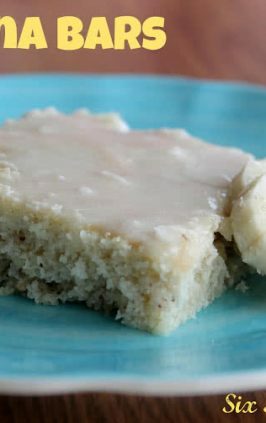 I make shortbread cookies also a recipe with a lot of different names, which I call snowballs (with nuts in dough and rolled in pwd sugar when warm) which also require vanilla. Wish I'd read your comment first. These turned out perfectly! The caramel layer was my favorite. The only changed I made was doubling it for a 9x13" pan.Thanks for the recipe! I am going to try doubled too, I wasn't sure what to do with the rest of the condensed milk. Can I use dark karo syrup? It should work just fine with dark karo syrup. I was excited for this recipe. I followed it to a tee, (I set the timer for the 5 min and the 2-3 min portion) so I was very sad when the Carmel turned out more like toffee. It was as hard. The same thing happened to me. I followed it word for word and my caramel turned into toffee. I tried it 2 times and both times the caramel went wrong. Our caramel turned out hard as well. We kept boiling for 5 minutes while stirring. Is that right?